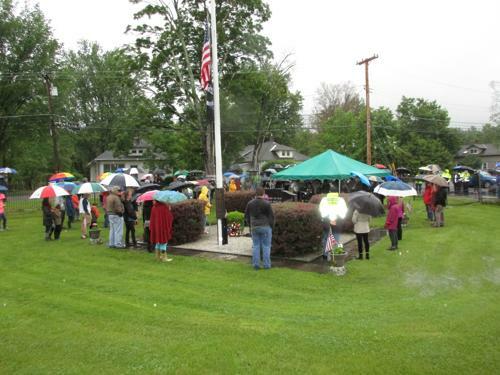 On Memorial Day 2017, there was an event that took place in Woodstock, NY. 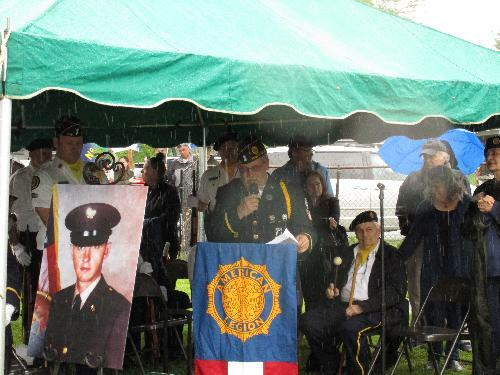 A soldier from the Vietnam War is being honored. 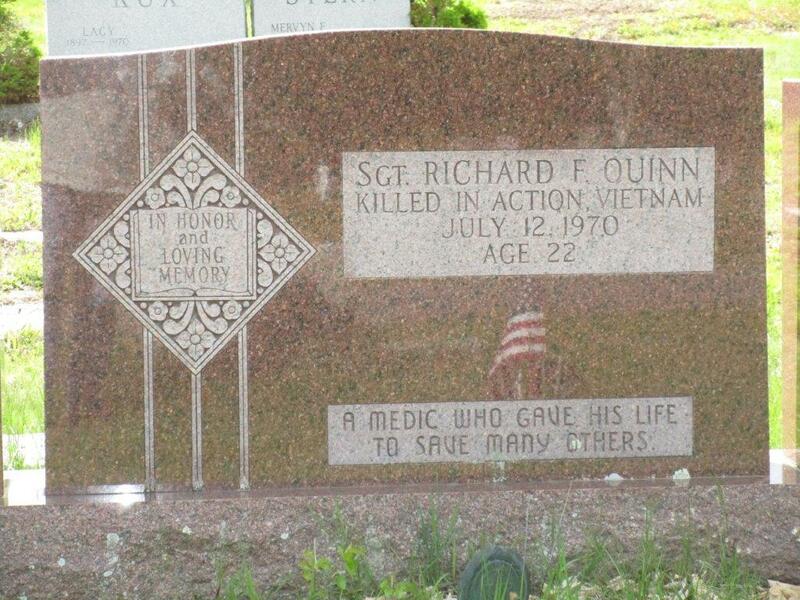 “Doc” Richard Quinn was the only Woodstock, NY resident that was killed in action during the war. 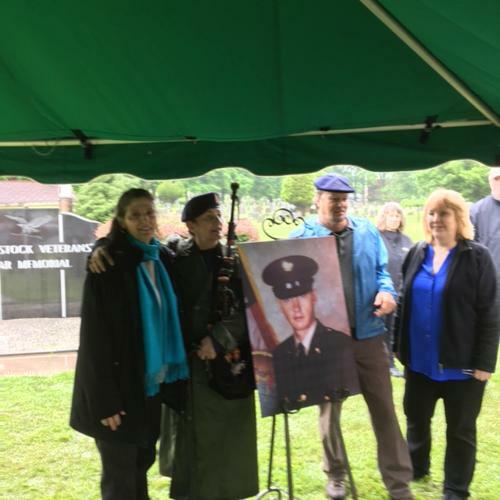 Included in this post is a copy of the speech, written by Richard's friend, Fern Malkine-Falvey , that was read along with a copy of an essay that was written by Doc Quinn before he was drafted into the Army. I had the honor of serving with all of the men mentioned in the tribute. (written by) Richard's friend, Fern Malkine-Falvey. 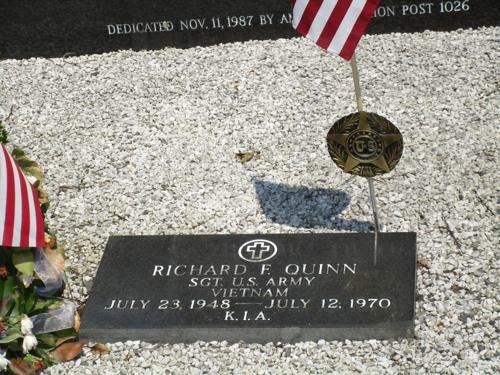 Richard Quinn didn't want to go to war. Very few do. He couldn't imagine killing anyone. He had just finished two years of college at UCCC, and was going to enroll at the University of Miami. 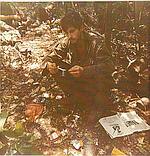 He was a Latin major – had received a scholarship in foreign languages. He was an honor student. He had spoken to a close friend about becoming a subway train conductor. He had big dreams about playing professional baseball. 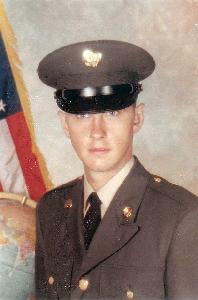 But the day after his 21 st birthday, on July 24 th , 1969, he received his induction notice, ordering him to report on August 4 th , to Fort Dix, NJ, for basic training. 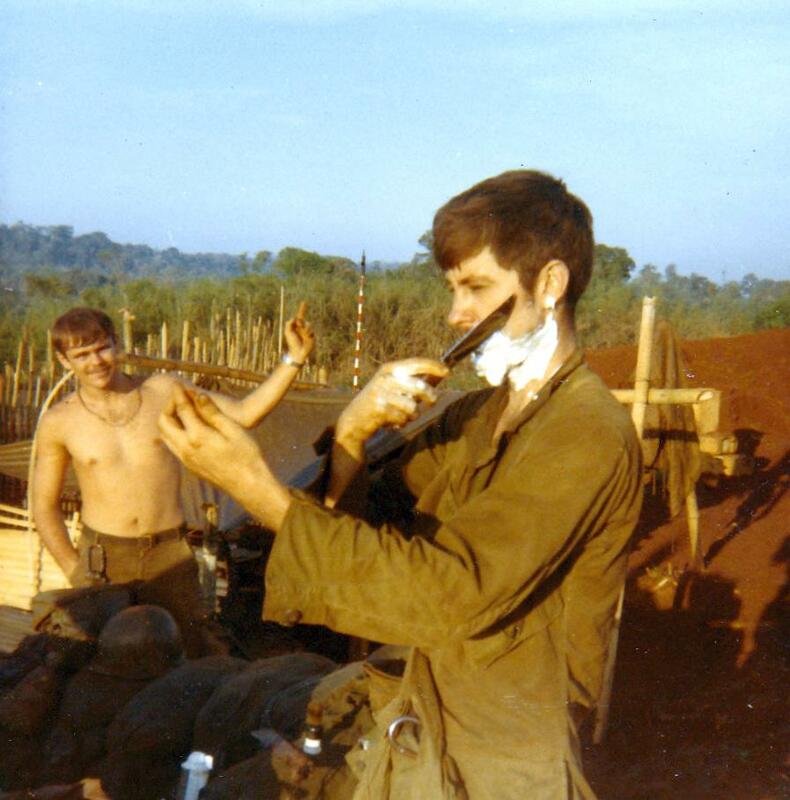 After completing those eight weeks of training, Richard was sent to Fort Sam Houston, Texas for 10 weeks of training as a Medic. For that is how he had decided he would serve; in this way, he would be doing everything he could to save lives, instead of taking them. 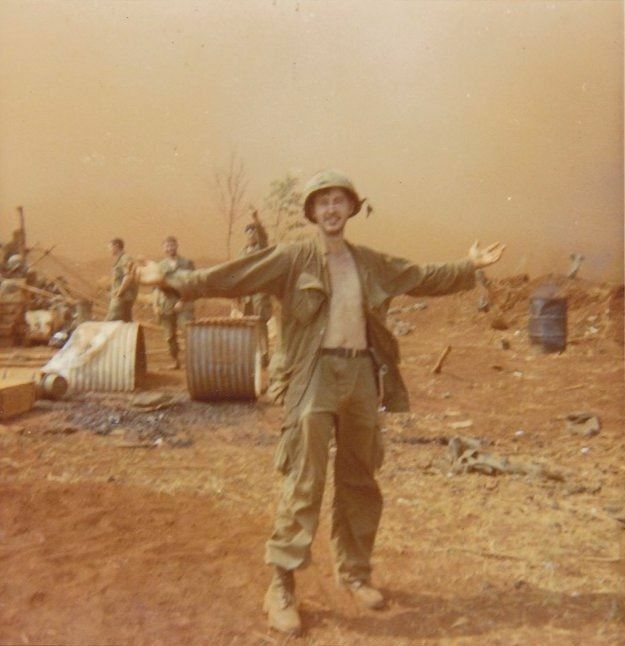 Richard did well in the Army; he wrote home to a close friend that it wasn't so bad – that he wasn't being harassed; that he was treated fairly. All one had to do was do their job. 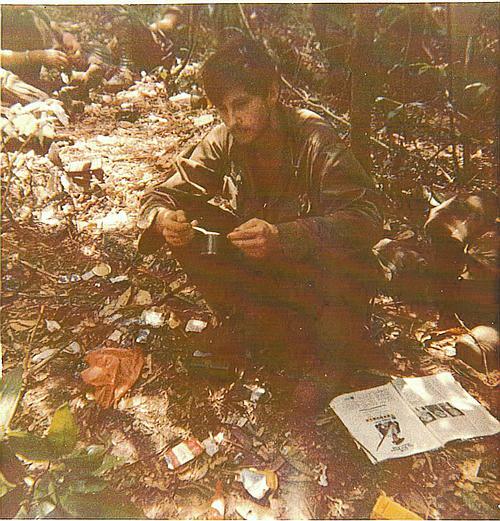 He learned all he could, as quickly as he could, for he'd be responsible – with only 10 weeks training – to save the life of every soldier that passed through his hands. The only two to die in the firefight that day were the two Medics. “Doc” Kloss had just turned 19; “Doc” Quinn was 21. They had both arrived in Vietnam, from opposite sides of the country, on the very same day, and died together on the same day. Exactly a year to the day that he received his induction notice, Richard was buried here, in the Woodstock Cemetery, one day past his 22 nd birthday. On the Vietnam Veterans Memorial wall, Quinn and Kloss' names are side by side, both gone too soon. 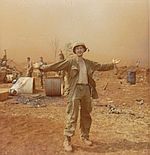 The Vietnam War was possibly the most divisive war – other than the Civil War – in our history. Richard, like so many others his age, did the best he could under extremely difficult circumstances, and died the most honorable way one can, according to the Greeks – by sacrificing his life to save another. 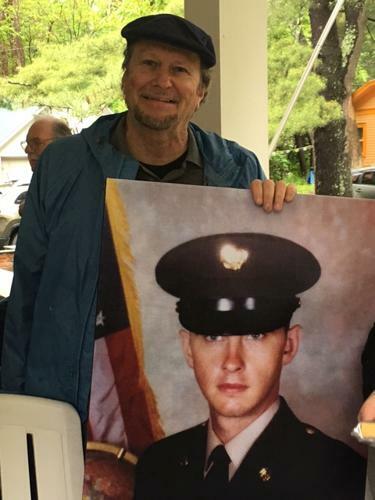 Although it is clear that Richard's last act on this earth was truly heroic, Richard would not have wanted to be glorified, but he would have wanted to be appreciated – to be remembered. 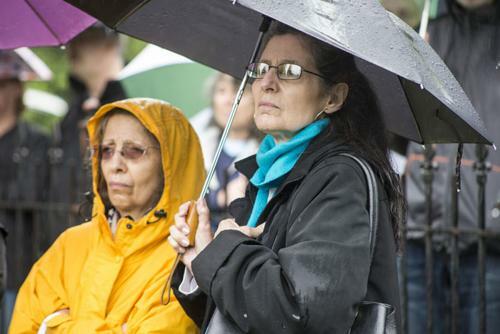 As he told his brother George just before leaving for Vietnam, “If I don't come back, keep my name alive.” Nearly half a century later, he would surely appreciate that we have come together, today, to do just that. people to the cozy little village nestled in the Catskills. an air of easy-goingness not with us earlier in the season. no cares in the world. strollers face and then passes on. Noise is everywhere! by from passing cars and strollers talk loudly among themselves. for in a short time it will be gone. 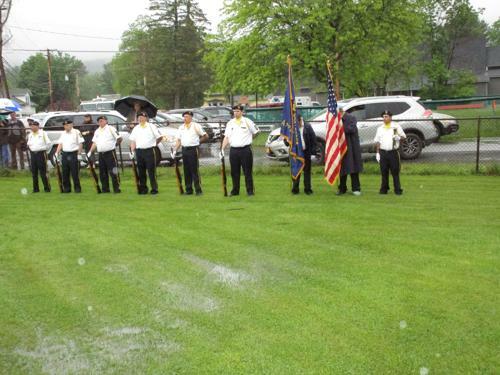 Terry Breitenstein, director of American Legion Woodstock, NY. 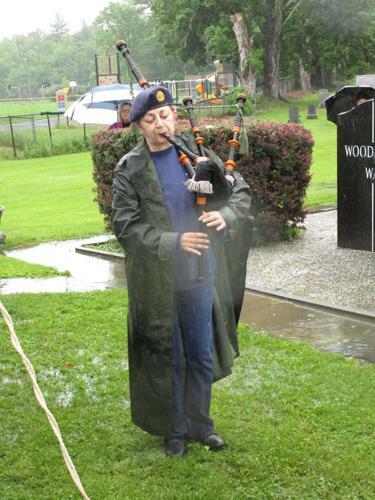 Peigi Mulligan playing Amazing Grace. 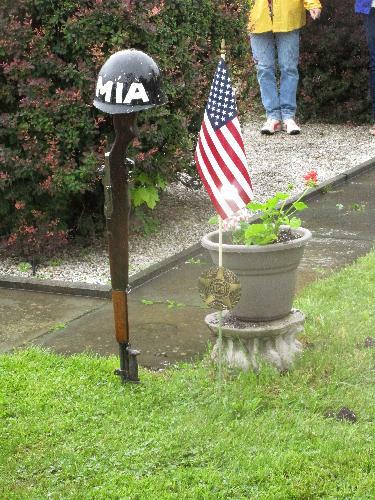 Marker for Woodstock Vets who died in all wars. Doc Quinn was the only Woodstocker to die in Vietnam War. Closeup of Doc Quinns marker. 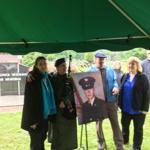 Fern, George (Doc Quinn's younger brother), and his daughter Bernadette at the American Legion, after ceremony. 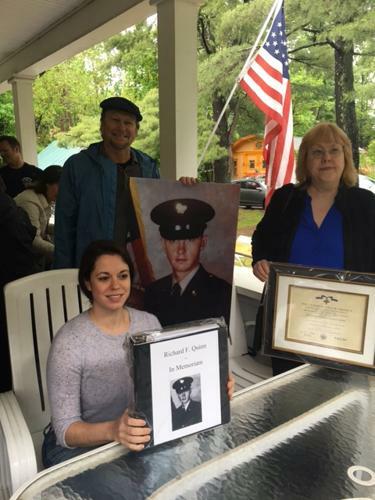 Bernadette (holding the Memorial album Fern made); George behind photo of brother Richard; Susan (Richard's sister) holding newly framed DSC award (at American Legion). Note from Fern: Bernadette never knew her uncle, but is really into the family history, and couldn't stop thanking me for all this. All these artifacts will go to her. They couldn't be in better hands. George and photo of his brother Richard (at Amer. Legion). 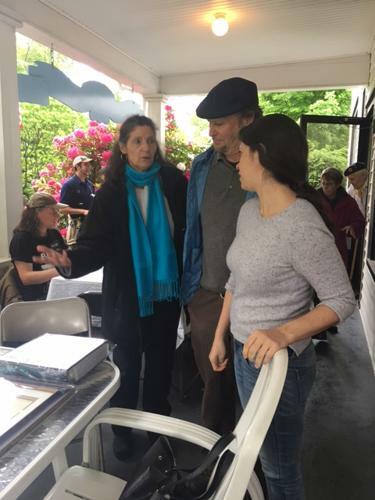 Fern, Peigi (the piper), photo of Quinn, George and Susan Quinn (Quinn's siblings). This is a photo of Fern (right) and her sister Shayan (in yellow). 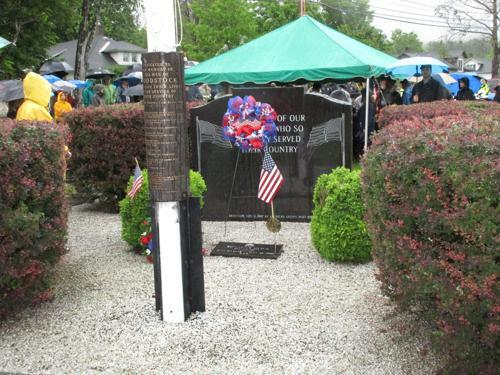 Note from Gordon: Fern was instrumental in putting this memorial together for Doc Quinn. 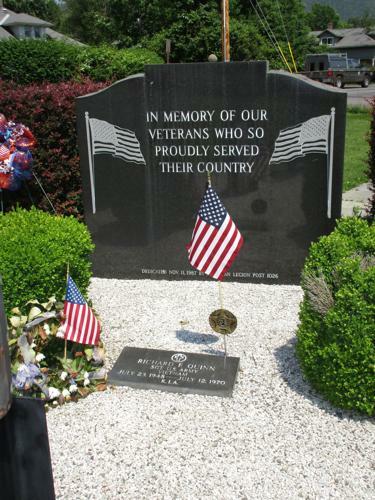 Thank you from all who served with him!